WASHINGTON - Electric providers in Florida, Ohio and New Jersey recently announced plans to expand electric vehicle charging infrastructure through various incentive programs that could add thousands of new public chargers in the next several years. American Electric Power in Ohio will offer nearly $10 million in incentives toward the build out of 375 EV charging stations throughout the company's service territory, which largely includes Columbus. Meanwhile, the Public Service Electric and Gas Company (PSE&G), an electric utility provider in New Jersey, has proposed a six-year plan to support the development of nearly 40,000 electric vehicle chargers across a wide range of customers and sectors, said Francis Sullivan, a spokesperson for PSE&G. And Duke Energy in Florida is installing up to 530 EV charging stations across its service area, as part of its Park and Plug pilot program, which will be making the charging ports available in multifamily housing complexes, workplaces and other high traffic areas. "We are bringing cleaner energy to Florida through 700 megawatts of new universal solar, and we are helping our customers to bring clean transportation to the state as well," Catherine Stempien, Duke Energy Florida president, said in a statement. "We are committed to providing smarter, cleaner energy alternatives for all our customers." The project in Ohio is making incentive funding available to government organizations, multifamily housing developments and workplaces, covering from 50 percent to all of the costs. The plan, to be rolled out in the next four years, aims to incentivize the development of 300 level-two chargers and 75 "fast chargers" capable of charging a car's battery in minutes rather than hours. "I think what's interesting about what we're seeing now in the industry is that electric vehicles and electric vehicle charging are expanding beyond California, and like other Pacific Coast states," said Scott Fisher, vice president of marketing at Greenlots, maker of car chargers and software. Greenlots has been selected as one of the companies to provide the chargers for the AEP project. California has occupied the lion's share of the electric vehicle market, making up about 5 percent of the cars on the state's highways. The U.S. market sits at about 1.5 percent. However, indications show the technology may be set to take off as more models are being rolled out, and prices are making the electric cars more competitive with their gas-powered counterparts. The group Securing America's Future Energy (SAFE) announced the one-millionth electric vehicle is on course to be sold in the United States this month. In a statement, Ben Prochazka, vice president of the Electrification Coalition, an EV advocacy group, called this "a major milestone and brings us one step closer to reducing our transportation system's dependence on oil. This is a direct result of the tireless efforts by communities and advocates throughout the 'EV ecosystem.'" In New Jersey, PSE&G's efforts -- which are part of the company's proposed Clean Energy Future program -- will not only focus on building out the charging infrastructure, but structure car recharging to encourage residents to charge their cars during off-peak times. "For now, with a modest number of charging stations in the market, it's not a huge problem. But over time, as you're putting in many thousands of these stations, what you want to make sure is that those stations are operating in sync with the grid. 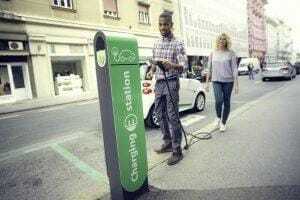 Where you don't have people all charging at the same time at like 5 p.m. on a hot summer day," said Fisher. PSE&G also plans to offer incentives to encourage the development of level-two chargers and DC fast-chargers, as well as "provide grants and incentives for 100 electric school buses and EV charging infrastructure at school districts in PSE&G's service territory," said Sullivan. "PSE&G will also help fund electrification projects at customer locations such as ports, airports and transit facilities," Sullivan added, via email. Utilities and transportation planners are also keeping the concept of equity in mind -- to ensure EVs are adopted by more than just the Tesla owner -- and will also focus on placing infrastructure in low-income areas. "Ten percent of the stations will be in low income areas, defined by census blocks," said Scott Blake, a communications consultant at AEP in Columbus. Duke Energy also announced 10 percent of the chargers it is installing in Florida will be in "income-qualified communities," according to a company press release.